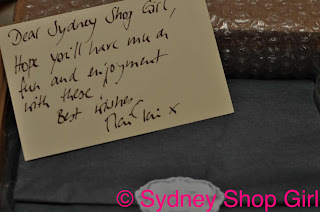 Sydney Shop Girl: Some Mai Tai Marvelous-ness. I wasn't the earliest bird up in my suburb today. The Australia Post delivery boy beat me to it. 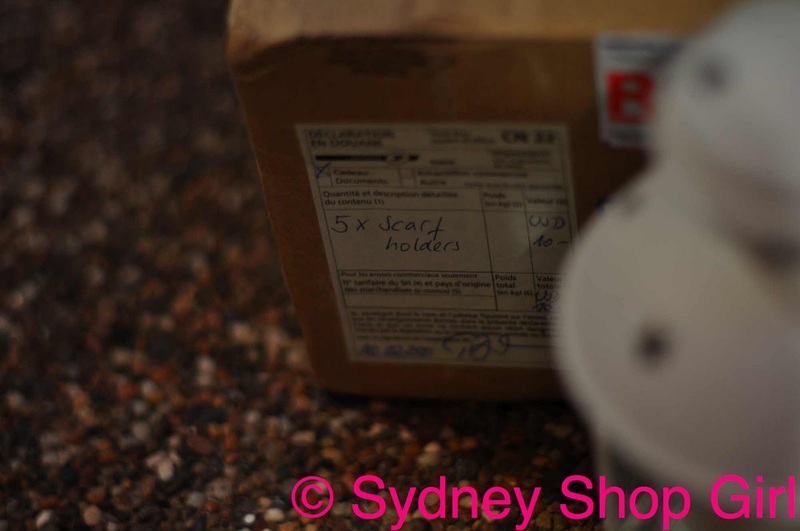 I'm thinking of getting my credit card details changed over to Sydney Shop Girl. To make it all official. Have you familiarized yourself with Mai Tai and her wonderful blog? It's full of gorgeous bags, scarves, Mai Tai herself and best of all .... Mai Tai's scarf rings and accessories which are in the Collection section. 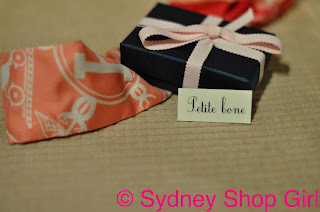 It was such a lovely gesture to add a personal note to a first time customer and very new follower of her blog. Thank you, Mai Tai. It was a tough decision as to how best to spend the half hour I had to get ready for the drive to work this morning. Playing with my new scarf rings or reading the paper with breakfast? It was a big news day in Sydney. Forget Silvio Berlusconi's questionable relationships with women in general. 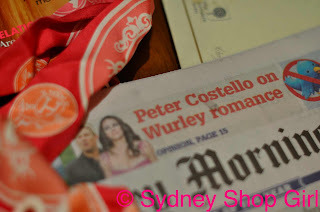 The big news in Sydney is that Peter Costello has lots to say on Wurley and the sincerity of sporting celebrities who do charity work. Oh, and NSW Labor can either look for a landslide loss if things go well for them or a megaslide loss if things are as dire as they are now in 6 weeks time. 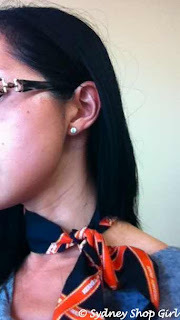 I was first put onto Mai Tai's scarf rings by a good friend of this blog, Kate B. Don't tell Hermes Inc. how badly I've mangled this Twilly. Grey shift dress - Zara. The other week, I was having a scarf crisis. No matter how I tie mine, they never looked quite as perfect as the way other people managed to wear them. I made my plight public and Kate B stepped in with the answer. Scarf rings. Mai Tai has a great solution here. A healthier looking knot with the aid of a cleverly placed scarf ring. It's harder than it looks on the video tutorial. But I'll get there one day. 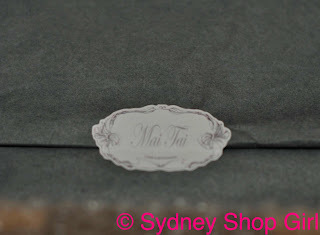 Mai Tai's scarf rings are well priced and so beautifully packaged. The variety of sizes is great because it means that all sorts of differently sized scarves can now be worn in more interesting ways. This is the petite bone scarf ring worn in the basic slide style. Twilly - Hermes, shirt and shorts - Ralph Lauren, belt - Esprit, petite bone scarf ring - Mai Tai. That's about it from me. I've got this week's The Only Way Is Essex to catch up with. From the rarefied world of Hermes and understated elegance to ummm..... Essex fashion week and technicolour tandoori tans. It's a crazy world, readers, crazy. OOh SSG happy to enable! You look tres chic and you'll have that pesky waterfall knot of MaitTai's down in not time! Mai Tai really is a wonderful wonderful style maven. I wish I could wear twilly's with pizzaz.. I just don't think they suit me :( :( :( yours looks beautiful!! I can only dream!!!! And by the way do you hit the gym a LOT? Oooh - Love a parcel in the post. Your twilly looks gorgeous SSG. Very professional (or "profesh" as my daughter would say). I am envious as I find that since I became over half century in age, twillys make me look very nanna-ish, which would be o.k. if I was a nanna, but I'm not! I haven't watched the Essex show yet. Probably the only trash reality show I haven't got sucked into on foxtel. Some men just don't get it. 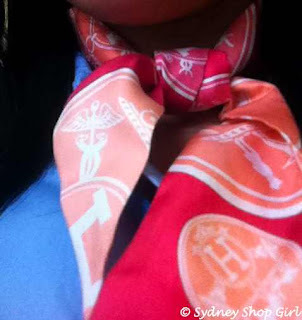 Maybe I need to buy myself a pretty scarf (and be taught how to make it look good!). What a sweet gesture! And those scarf rings are such a smart invention! Scarves are one of those accessories that polarize us, I think. There are the nanna connotations yet they really can lift a simple outfit with very little effort. And they pack well. On things Essex, I am now determined to visit at least once in my lifetime. The accent. I love it.